Glaser defines The Word as an intimate, loving encounter with God. 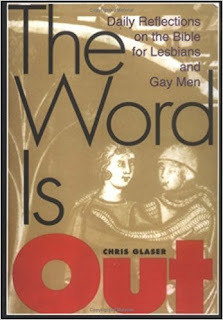 Through reflection on the Bible in the light of the particular experience of lesbians and gay men, that Word may emerge and embrace a community that the church has often rejected. Each entry of this year-long daily devotional begins with a scripture verse and concludes with a prayer or affirmation. Okay, I normally don't review a book till I have read a book all the way through, but this book is not a normal book. It truly is a daily devotional book and so far, I am enjoying it. I am a few days into it and it is very good. It may have been written in 1999, but it stands true with today's time. I had been looking for one and this book is just one of my daily devotional books. I highly recommend it!